Sure, Delicate Arch, Dark Angel and the Fiery Furnace beckon, but so does the toe-friendly sand, acres of kid-friendly climbing and memories of spending the night in a tent with your family in Devils Garden. Camping is a part of many Utah Bucket List adventures, but in the case of Devils Garden Campground it is THE item on the list, at least for me. 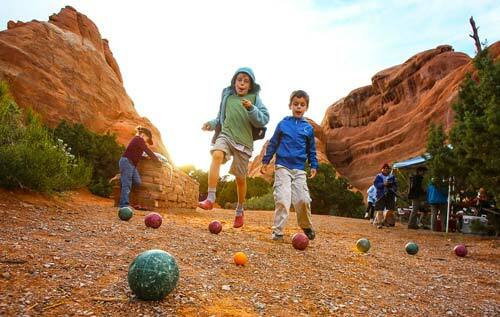 As the evening light descends kids play a round of bocce ball while camping in Devils Garden in Arches National Park. Some prefer an Arches base camp in Moab with an air-conditioned hotel room — not a bad idea in the middle of summer — but there is something about falling asleep and waking up in the park that enhances the experience. 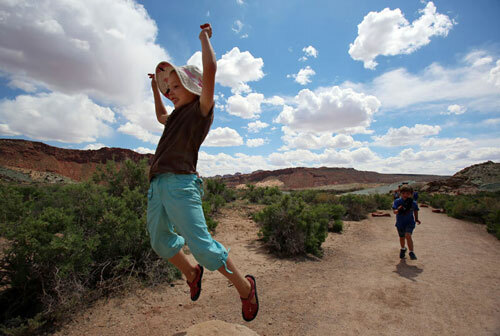 "There is a lot of work that goes into camping with your kids, but there is a lot of return as well," said Heidi Prokop, of Salt Lake City, during a trip to Arches and a stay at Devils Garden. "When we arrived my [5-year-old] son was asking for the iPad. We immediately showed him the wonders of searching for bugs and lizards. Exploring the natural world sort of realigns the whole family to what is most important to us." The iPad was left in the car as all the kids in our camp crawled on petrified sand dunes, rolled down sand hills and hunted for caterpillars and beetles that stuck their bottoms up in the air when threatened. Devils Garden includes 50 campsites and two group sites that can be reserved. Many are tucked into the slickrock, providing some privacy and a built-in playground for kids. But it is not only children, however, who feel like playing. "Kids look at this place just like I do, as a big sandstone playground where you can climb on these rocks and feel like a giant and like you just reached the top of your own personal mountain," said Arches National Park naturalist Karen Henker. "Every campsite has its own little nooks and crannies to explore or a rock fin or a little garden of flowers. "And our sand is famously fine. You just want to dig your toes into to it. We are walking through sand dune deserts millions of years old." My 8-year-old daughter, Lucie, found the sand can also serve another purpose. "Sometimes when you dig down the sand gets cool and it feels so good on your feet," she said. Such are the memories of family camping Arches. Our family has plenty of them. Like the time my oldest son, then 6 or 7 years old, finally caught a lizard after many futile attempts only to have the creature ruin his elation by nipping him on the finger and sending him into tears. On another trip when he was still a toddler the wind ripped the pacifier out of his mouth when we made that final turn from the trail to Delicate Arch and carried it over the cliff, prompting a trip all the way to Moab for a new binky. We have photos of our family enjoying a break from the sun under Wall Arch, just past Landscape Arch on the Devils Garden trail. Little did we know the arch would collapse during our lifetime: The 71-foot-tall and 33Â½-foot-wide arch collapsed in 2008, blocking the trail but fortunately not injuring any visitors. The start of every hike starts off fast with lots of energy as Mira Tueller, 5, jumps off each rock she comes across before settling in to slower pace allowing the adults to catch up while hiking in Arches National Park. "That event was really a gift," Henker said, "a reminder to us all that these things are moving. Human beings just don't live very long, and we don't have a chance to witness geology in action. It was also a bit of a safety wake-up call. By definition, these things are on the move." A huge slab broke off of Landscape Arch in 1991, forcing park officials to close trails under the formation. Henker says there are more than 2,000 documented arches in the park. "It is the densest concentration for natural arches in the world," she said. "The majority are not visible from the scenic road, but a lot of them are hiding in plain sight." She suggests parents explain that an arch only needs to be a 3-foot opening in any direction and then encourage kids to see if they can find arches not shown on the park map. Experiencing Arches National Park during the day with the masses is one thing; watching the sun set, seeing the stars pop out and crawling into the tent with your family is another. "It's fun to all sleep in one place," my daughter said. "Sometimes it is good to see each other so much more and that we are all together in our sleeping bags." "My children will look back on these times of camping and recognize them as important family opportunities and times that they grew and explored on their own," she said. "I think they will cherish these opportunities and, hopefully, take their own kids camping as well." The 50 campsites and two group sites at Devils Garden Campground in Arches National Park can be reserved March through October and can be made up to 180 days in advance at http://www.recreation.gov. Campsites 1 to 24 are open November through February on a self-serve basis.